There are many cases in Hollywood where films with similar premises arise at the same time; sometimes so identical that they’re hardly distinguishable. Oftentimes these movies tend to be ridiculous popcorn flicks that more or less are trying to cash in on a fad or a topical event. Sometimes these movies go into development at the same time and are released within months of each other. Others are made in response to another’s success, either trying to duplicate the same formula or taking the earlier film even further. Either way, movies like these are often looked at as the reason why people believe that Hollywood is running out of ideas. That could be true, but then again, why would somebody put effort into making a movie that they already know has been done before. I wrote an article about copycat films earlier this year, and in that article I noted that following a trend usually factors into why these movies get made, but what I find interesting here are films that follow similar formulas that seemingly rise out of nowhere. The blockbuster era of the 90’s saw a lot of this, with disaster movies dominating the cineplexes. It seemed like at this particular time, studios were sold more on concepts than stories and it ended up starting a race to see who could capitalize on them first. This particular idea of concepts driving development has led me to create this new series where I take a look at movies with similar scenarios, and decide which one did it better. In particular, I will take a look at these so-called “cinematic twins,” as well as movie remakes, copycat films riding the coattails of other popular flicks, and movie homages where they copy other films on purpose. And by contrasting these movies, I will hopefully make it clear how one or both succeeds and/or fails with the premises that they share. For my first article in this series, I thought I would look at two movies separated by 17 years of film history, but are still deserving of a comparative analysis. 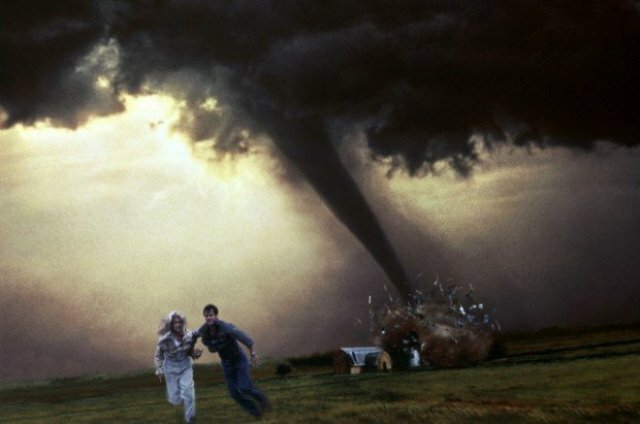 Sticking with the disaster movie genre, I am bringing Jan de Bont’s 1996 thriller Twister and SyFy Network’s 2013 blockbuster Sharknado into the ring, and see which one is the better cyclone-based action film. Now, on the surface, you may think that these two have nothing in common. Apart from the lengthy space of time in between their premieres, the movies are also significantly different in scale and production values. One is a big budget film that features a star-studded cast and top-notch special effects work, while the other movie is a made-for-TV schlock-fest featuring D-List actors and C- grade CGI. But, the question that I pose is whether or not those differences in film quality make any difference. Let’s be honest, they are both incredibly flawed films, but does one of these movies actually benefit from it’s flaws, while the other is sunken by them? Do lowered expectations come into play, or must a movie purely be judged on the quality of it’s production? I put forth the idea that Twister and Sharknado are very comparable movies, because of the way that they exploit their premise with very little thought for anything else like plot and character development; or science for that matter. In some ways, that’s what makes them both entertaining to watch. But what definitely separates these two movies significantly is their tone, and that’s primarily where I will find the strengths and weakness in each. So, between Twister and Sharknado, who made the better corny Tornado movie? First of all, we’ve got to exclude comparisons in the quality of the special effects in the two movies, because on that front, Twister clearly would win. On top of that, Sharknado isn’t even attempting to try to match Twister’s quality of CGI animation, nor would it be allowed to. The only way that the two films can be comparable here is when it comes to and how they use their production values. What I find interesting about the way Sharknado uses it’s effects is that every special effect is there to punctuate a moment in a hilarious fashion. In Twister, the effects are there to create a foreboding atmosphere, something that it does very well. Honestly, the best thing you can say about Twister is that it actually looks like the characters are really caught up in a storm. Sharknado on the other hand doesn’t even try to hide the fact that it was shot in the middle of Summer in Los Angeles, with the titular “Sharknado” appearing out of clear blue skies. But, then again, Sharknado delivers on what it promises, which is the mindless destruction of a famous city. While it does look cheap as hell, it nevertheless paints a broad picture. Twister on the other hand, with all it’s endless resources, tends to keep things squarely grounded, and as a result it feels smaller in ambition. All we get in Twister is a lot of torn up farmland, but not much else. The only time that Twister really goes a little nutty is towards the end, when Bill Paxton and Helen Hunt’s characters are fleeing the massive F-5 tornado, including a part where they drive their truck straight through a displaced farm house. By keeping things a little more subdued in the beginning, Twister almost undermines it’s ability to entertain with it’s premise, something that the more outlandish Sharknado takes full advantage of. So, yeah the sharks in Sharknado look totally artificial, but they’re used to their full potential. Better looking tornadoes in Twister cost more, so it limits how much they can be used, thereby lessening their impact. But, restraint can be a blessing. Those moments when the tornadoes appear in Twister are very impressive, even by today’s visual effects standards. And by limiting their presence in the film, it also make them stand out and be more impactful. If only everything in between worked as well. Twister’s main flaw, above all the other big ones, is that there is no consistency of tone. It goes from melodramatic to absurd many times over throughout the very thin plot, and sometimes the tonal shifts are jarring. There’s also a certain uncomfortable grimness through many of the scenes, particularly regarding ones centered around Helen Hunt’s character, Jo. She has a tragic past that is alluded to frequently, but is never fully explored. This has actually resulted in some of the movie’s most notorious scenes, like the infamous “finger of god” moment halfway through the film. The moment’s attempt at sincerity falls flat on it’s face, and ends up being hilarious instead. But, while a moment like that is remembered fondly for how awful it is, it unfortunately is not true for the rest of the movie. Twister never cohesively comes together, and is only remembered for parts than as a whole. Sharknado on the other hand is consistently absurd from beginning to end. 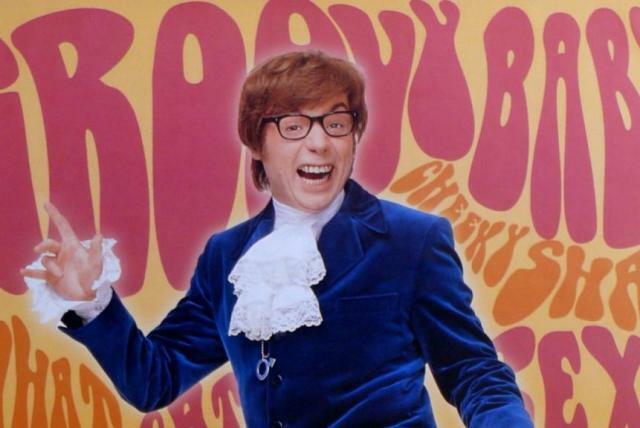 It wears it’s preposterous-ness proudly and manages to carry it through to the end. But in many ways, that can also work as a negative. At some point, when your film is consistently ridiculous, the humor can run it’s course and start to feel old. 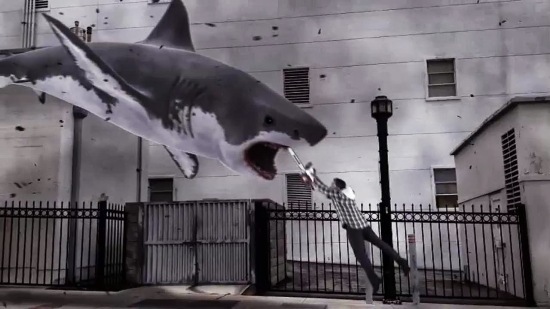 To it’s credit, unlike so many other SyFy films, Sharknado doesn’t lag too much. But there comes a point where you begin to get tired of those long scenes inside the getaway truck with inconsequential dialogue between characters . There is a balance that these kinds of movies have to adhere to in order to keep them from going to either extreme, but when comparing these two films together, it seems like Sharknado benefits a little more by going further in one particular direction. What ultimately determines what makes one of these ridiculous movies better than the other is the intent vs. result factor. Did each film do what it was meant to do ends up being the defining question, and in this case, the results work more in Sharknado’s favor. Sharknado was conceived from the very beginning to be exactly what it is; low-budget cheese meant to exploit an already ridiculous premise. And in every respect, it fulfills that promise. Lowered expectations makes the shoddy production values acceptable for audiences wanting just that, and Sharknado never disappoints by always disappointing. Twister on the other hand is trying to reach higher aspirations, but the results don’t reflect that. Twister was never intended to be seen as a joke, but rather a sincere look at the destructive effects of tornadoes in America. The fact that it fails at this so measurably is what has made it noteworthy, but it also makes the film much more notorious. Sharknado actually encourages it’s audience to laugh along with it, but when you laugh at Twister, you can’t help but think that it’s at the expense of someone else’s serious intent, deserved or not. Twister is exceptionally well made, but because it failed in the story and script department ultimately makes it seen as a failure with regards to making it’s premise work. 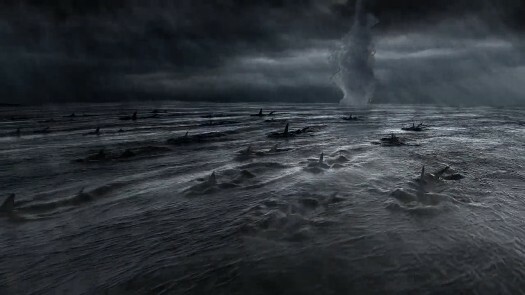 Sharknado accomplished it’s goal of giving us a tornado filled with sharks along with intentionally bad acting and dialogue, and that was a result worth rewarding. Sometimes it helps to step back and embrace the absurdity whole-heartedly. And again, the tone shifts matter with this distinction. There are instances in Twister where the film does deliver some memorably absurd moments. 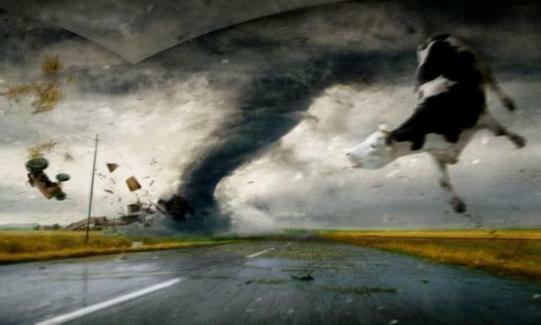 They had cows flying in tornadoes long before there were sharks. But, whenever the love triangle story-line works it’s way in, the story derails. And what’s more, the movie tries to make it’s science seem logical, when any meteorologist will tell you that it’s complete nonsense. Whenever the movie tries to sell itself as thought provoking when it’s obviously based off of junk science, that’s when you begin to question it’s validity as a whole. Sharknado on the other hand so obviously doesn’t care about scientific accuracy, and it actually makes the absurdity of the movie all the more enjoyable. The character’s big plan for stopping the “Sharknadoes” in the movie is to drop explosives into the vortexes and blow them up. That idea is so ridiculously stupid that it’s genius, on the part of the writer I mean. What better way to end a movie with this ridiculous a premise than by having the characters take on the most absurd actions possible. At least the filmmakers had the good sense to make it purposefully dumb. When Twister tries to make the implausible happen in their movie, we can’t just turn our brains off and accept it, because the movie’s tone hasn’t allowed us too. When Bill Paxton and Helen Hunt survive a tornado’s path of destruction by strapping themselves to a pipe near the movie’s end, we don’t know whether to accept that as a believable conclusion or to laugh at it’s preposterous-ness, because the movie never makes the tone clear. With Shaknado, madness is it’s ultimate purpose, while there never seems to be any purpose in Twister other than to get the plot where it needs to go. The reason why I feel that these two movies should be judged against one another is because it shows how Hollywood movies ultimately rise and fall in unexpected ways. Here we see a big budget blockbuster fail to make good on it’s premise despite having all the resources available to do so, while another film gets made on a shoe-string budget with very little expectations and delivers on what it promises. In the end, both movies are absurd disaster flicks that end up being more stupid than thought-provoking. But what makes one better than the other is that one movie was made that way on purpose, while the other squandered it’s potential. It’s amazing that a movie with wooden performances from the likes of Ian Ziering and Tara Reid could be more entertaining than a film with future Oscar-winners like Helen Hunt and Phillip Seymour Hoffman in it’s cast. But then again, Twister is a movie where Hoffman is reduced to saying the phrase, “I’m talking imminent rueage.” Twister hopes that people will excuse it’s lack of subtlety while Sharknado draws attention right to it, and that ultimately makes it feel like a more honest film. The independent film market can be full of itself sometimes, but so can blockbuster movies, and that’s why I cherish the ridiculousness of Sharknado, because it shows that movies like Twister can never be taken seriously or should. Yes the conditions for each film’s productions are different, but in the end, they are not that dissimilar, and that’s a result of Sharknado‘s success and Twister’s failure. So, in the end, Sharknado stands as the better movie, thanks to a consistent tone and a knowing sense of humor. Twister has it’s moments, but it hasn’t aged well over the years, and considering that a made-for-TV monster movie has done the tornado disaster premise better (and with sharks no less), it doesn’t reflect well on the studio movie-making machine. There are few popular franchises out there that feel as peculiar as the Planet of the Apes series. Those “damn dirty apes,” as Chuck Heston so famously called them, have become the stars of one of Hollywood’s longest lasting and profitable franchises. Just by looking at the premise on it’s surface, it’s any wonder why this series has become so influential. In essence, it’s a campy sci-fi series that once relied upon actors wearing monkey masks, but when looking closer, it’s clear that there is so much more to these movies. The original Planet of the Apes was based on the novel of the same name by French author Pierre Boulle, and was quite an ambitious and gutsy undertaking at the time. Instead of using the source material as a basis for an exploitation action treatment, 20th Century Fox decided to do an earnest adaptation and retain all of the social commentary and underlying themes contained in the original text. Couple that with assured direction from Oscar-winner Franklin J. Shaffner (Patton) and a cast of quality actors like Heston, Roddy McDowall and Kim Hunter, and the result was a critically acclaimed action thriller that served as a touchstone film for American cinema at the time. The success of the original was probably due to the fact that it wasn’t a dumbed down treatment, and it actually challenged it’s audiences, dealing with key issues like civil rights and nuclear proliferation, which were on people’s minds at the time. Also, there was that memorable and bleak twist ending that people still talk about today; which came courtesy of Twilight Zone scribe Rod Serling. Overall, Planet of the Apes proved to be a monumental film because it was far more intelligent and challenging movie than you would be led to believe, and the ability to preserve that trait in the series is what has made or broken every film thereafter. Indeed, it’s whenever the series dumbed itself down that it has faltered. Sometimes when new filmmakers come in, they see the Ape costumes and makeup as the main appeal of the story for audiences, but that’s not the case. It’s seeing our world reflected back at us through this alternate version that we find so intriguing. What’s frightening about the concept of the story is that humankind loses it’s freedom and identity when a new dominant species rises above them, and it makes us look at ourselves and how we’ve unwisely used our own power to subjugate other people. That’s the true terror behind the story; that apes have become so human in the worst ways, and that humans are now the ones suffering. Whenever the series strayed from this idea, it lost much of the edge that the franchise is known for. The series continued through Beneath the Planet of the Apes (1970), then Escape from the Planet of the Apes (1971), and then it concluded with a saga that introduced the character of Caesar (played by Roddy McDowall) with Conquest of the Planet of the Apes (1972), and Battle for the Planet of the Apes (1973). It was a rapid fire series that remarkably sustained it’s popularity until the G-Rated Battle under-performed. It wasn’t until 2001 when Tim Burton made his reboot that we saw the apes on the big screen again, and it proved to be a huge misfire. This is mainly due to Burton’s lack of insight into what made the original so effective, and instead the movie is filled with more action set-pieces than actually social commentary. It would take 10 years before the series would be given a second life thanks to a refocused attempt at bringing the franchise back to it’s basics. Instead of returning to the very beginning, the new reboot instead looked at the Caesar saga for inspiration, particularly drawing from Conquest’s story-line, and the result was the surprisingly successful Rise of the Planet of the Apes (2011). Rise helped to reinvigorate the dormant franchise and it continues again with this year’s newest entry, Dawn of the Planet of the Apes. Dawn takes place 10 years after the events of Rise, following the outbreak of a deadly virus that has wiped out almost all human life on the planet. This same virus, which has been dubbed the Simian Flu, was used in the Rise story-line as the thing that gave the Apes their human-level intelligence. 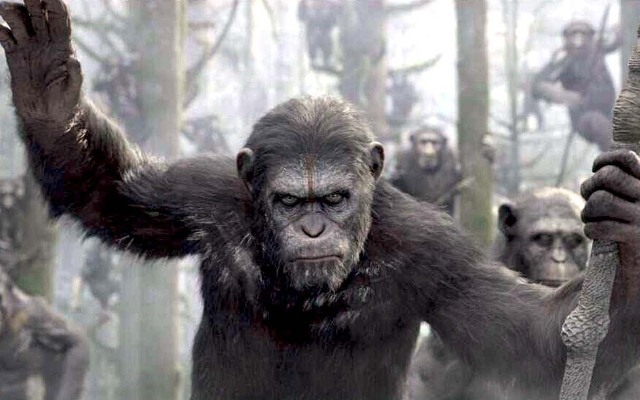 Caesar (played in both Rise and Dawn by Andy Serkis) was the first successful test subject and with his extraordinary intelligence, he led all the other Apes in revolt against the humans. In the years since the virus took it’s toll, the Apes have thrived under Caesar’s leadership, while the remaining humans scramble for what’s left of their society. At the beginning of Dawn, a group of human explorers stumble into Caesar’s camp. Led by a peaceful engineer named Malcolm (Jason Clarke) the humans only wish to restart an old hydroelectric dam in the middle of Ape’s territory, so that they may have the power to contact the outside world. Caesar doesn’t trust them at first, but reluctantly allows them to do their work in order to avoid further conflict. Taking the diplomatic approach works well for both camps as Caesar and Malcolm learn a mutual respect for one another. This harmony is broken, however, when a vengeful ape named Koba (Toby Kebbell) wishes to start an all-out war with the humans in order to wipe them out for good. Meanwhile, in the nearby human colony, housed in the ruins of San Francisco, the colony leader Dreyfus (Gary Oldman) is resorting to ever more drastic means to keep order within amongst his people. All this leads to a powder keg that is ready to erupt, which will test Caesar’s ability to lead his community and bring the humans and the apes to an inevitable conflict. What I like about this film, and the movie that it follows up (Rise), is that they both keep to the original spirit of the first film in the series, without having to retread old ground. Instead, they expand on the universe by filling us in on how Apes came to conquer human beings and become the dominant species on the planet. It follows the same evolution of the saga that Conquest of the Planet of the Apes delivered, but shown in an entirely different way that builds perhaps a little more believably than those early films did. In fact, the best thing about these new films is that you don’t need to see any of the other entries in the series in order to understand what is going on. They stand on their own as fully realized narratives, although it might help to have seen Rise before Dawn, especially when it comes to understanding where the virus came from. Other than that, Dawn does what all great sequels do and that’s to expand the world that’s been set up before and take it in a new, unexpected direction. Indeed, Dawn works in many ways that Rise had failed to do; although there were a few things that Rise did better, but I’ll get to that later. What I liked best about this movie was that it kept the intelligence that the series is best remembered for. It doesn’t resort to cheap plot twists and mind-numbing action. It actually uses most of it’s run-time to build character and atmosphere, which both brings out the best elements of the franchise and also makes this movie feel like something new as well. Indeed, it does still feel like a Planet of the Apes movie, but one that is less inclined to reference anything else from the series. Really, the only references I can remember to other movies was seeing Caesar and his fellow apes riding horses in a few scenes, and also giving one of the Apes the name Maurice ( a clever nod to original Dr. Zaius actor Maurice Evans). But if you want to look at what really makes this particular film notable, it’s the performance given by Andy Serkis as Caesar. Serkis has pretty much become the master of motion-capture acting, gaining notoriety over everyone else in this particular field. Probably best known for his motion-capture and voice work as Gollum in the Lord of the Rings and Hobbit series, Serkis has taken his expertise with the process and used it to create a truly memorable protagonist with Caesar. It’s amazing how advanced this kind of animation has progressed over the years, becoming increasingly more capable of capturing an actor’s full performance in a digital character, and Andy Serkis has taken full advantage of that. Caesar really commands every moment he’s on screen, and Serkis deserves all the credit in the world for finding the humanity in the character and bringing it out through all the layers of performance. The animation team should also be commended for picking up all the little gestures and subtlety in Serkis’ performance, because it all helps to make Caesar feel absolutely real. I’m glad that the Apes franchise has served as a great platform for Andy Serkis to expand his talents as a performer, and indeed here he is the film’s primary star. The same care with the performance capture also extends to the other cast members playing apes as well. I particularly like the way that each ape interacts with one another, with body language playing an integral role in the establishing character. I also like how speech is used sparingly between the different apes, making it’s usage feel all the more powerful when it happens. Serkis (who also provides Caesar’s voice) came up with an interesting way for the apes to speak that feels natural and unlike anything we’ve seen in the series before. It may come as unusual to see digital apes replace the costumed ones that the series was known for in the past, but when the end result works as well as these do, it’s hard to argue. Unfortunately, the same cannot be said with the human cast. Indeed, one of the things that Rise of the Planet of the Apes did better than this film was to build up it’s human cast of characters; which is understandable considering they were much more important to the plot. In that movie, we had James Franco’s scientist motivated by his drive to cure the Alzheimer’s disease in his dying father (played by John Lithgow) as well as his conflicted dilemma when he grows too attached to lab monkey Caesar, whom he helped raised; both of which drove his character development in the movie. In this film, the human characters are more or less just defined by their purpose in the plot and nothing more. None of them are really unlikable, though; there’s just nothing to define them. Jason Clarke does the best that he can, but in the end, his character is just forgettable in comparison to Caesar. Gary Oldman gets even shorter shrift in the movie, reduced to little more than an extended cameo. I felt that it was a waste of an actor of his talent, and I wished they had used him more. His character’s motivations also don’t make much sense in the movie; with him starting off as a reasonable leader in the beginning, then becoming an almost zealous antagonist by film’s end. It’s a whiplash in character motivations that I wish had been better explained. Now while the apes’ story-line is effectively drawn throughout the 130 minute run-time, it’s the human characters that suffer. This may be a rare case where I think an even longer cut may have helped a movie, just so that we can better understand the human characters, much like how Rise was able to. There was some of that there in the film, like when Oldman’s character reacts to seeing pictures of his long dead family for the first time in 10 years in a beautifully acted scene, but it was too few and far between. The movie just needed to have a little more balance, and that’s all. But, other than it’s under-drawn human characters, the remainder of the movie is exceptionally well crafted, if not particularly groundbreaking. Indeed, the movie stays true to formula, but it’s done so effectively that you don’t mind it so much. The pacing of the movie is excellent, never feeling bloated or rushed at all, and it does lead up to a very satisfying conclusion. Again, the apes are definitely the film’s highlight, and the attention given to establishing their society really makes this movie feel unique. I commend the production design team for making the post-apocalyptic setting feel natural and not at all overdone. There’s an interesting contrast in seeing the organic and thriving Ape village juxtaposed with the decaying human world in this movie, and it establishes perfectly how the story is going to play out without ever stating the obvious. I also loved the musical score by Oscar-winning composer Michael Giachinno (Star Trek, Up), because it pays homage to the late Jerry Goldsmith’s iconic themes from the original film’s score, without ever copying it directly. It also helps to make this film feel right at home with the other movies, especially in helping to drive the mood of the scenes. The cinematography also gives this movie a nice epic feel, even when working with a narrower frame (this is the first film in the entire series shot in the 1.85:1 aspect ratio, whereas all other entries were in the scope 2.40:1 format). It’s an interesting creative choice made by director Matt Reeves, who makes the film feel both intimate and grandiose in a well-balanced way. The movie takes some creative risks, but they pay off and work to the film’s advantage, and honestly, that’s what a Planet of the Apes movie should do. In that respect, it’s staying true to it’s legacy. When we go to the movies, we above all are looking to be entertained, and it is usually expected of Hollywood to deliver on that front. However, even with millions of dollars invested and hundreds of man hours spent in production, there’s still a good chance that whatever Hollywood puts out from week to week will still fall flat. You could probably chalk that up to the homogeneous nature of the business, where studios try to copy one another’s success and few chances are taken. How many loud and vacuous action films are we presented with every summer? Eventually, the movie-going public grows tired of the same old thing and wants to look for something new on the big screen. This has led to a special niche market in cinema called the Art House scene. An art house cinema is usually a small venue, sometimes made up of only one or two screening rooms, that presents films made outside of the studio system, and/or are usually made on a smaller budget. Commonly, an art house cinema is the only possible place in your local community that screens international, foreign release.s Also, if you are an up-and-coming filmmaker, an arts cinema might be where all your hard work will finally receive it’s first viewing. I believe what makes art cinemas special most of all is the fact that they provide a welcome alternative to the multi-screen cineplex experience. While it may be quieter and more classy, it’s still no less of a place to be entertained. Art House Cinemas gives us the ability to discover and enjoy something new, as well as to serve as a welcome communal ground for both cinephiles and casual viewers alike; bringing the idea of cinema alive in ways that the big guys can’t. Art House Cinema has been around for a while, but it didn’t become a common thing until the later half of the last century. The studio system more or less kept all theatrical presentations under their strict control up until the 1950’s. Up until that time, all movie theaters were contracted to release only whatever the studios were making. In addition, back in those days, movie-going experiences were more of a casual experience, with people coming and going as they pleased, not caring if they’ve seen the program in it’s entirety. But, with the dissolving of the old studio system in the 50’s and 60’s, local cinemas were freed up to showcase whatever they wanted. Most often they would still showcase a studio film, but if the demand was there, a community cinema could show something out of the ordinary. Usually this would be an internationally acclaimed film from a foreign land, like the works of Japanese filmmaker Akira Kurosawa or Swedish director Ingmar Bergman. But also at this time was the rise of the independent film. Independent cinema became a great way to tap into the changing cultural landscape that was happening in America and spread it across to multiple markets. While most Middle America cinemas stuck with the same old studio releases, many local theaters in big cities and college towns across the country started to specialize their programming around audiences wanting to see these new, progressive films. Thus, did we see the beginning of specialty, art house theaters. Some presented films that you could instantly classify as art, while others were clearly geared towards exploitation. Despite whatever class of audience these theaters were catering to, there’s no doubt that it was a change that would never go away. There was, however, a time where art house cinema did see a decline. In the 1970’s, Hollywood began to embrace independent filmmakers and brought them more into the mainstream. No longer were the likes of Francis Ford Coppola and Martin Scorsese working outside of the system; in these years, they became the system. Cinema as a whole changed dramatically during this time, and the line between independent film-making and studio film-making became increasingly blurred. With the arrival of George Lucas and Steven Spielberg in the late 70’s and early 80’s, we began to see the rise of the blockbuster, with the phenomenal premieres of Jaws (1975) and Star Wars (1977). This era again changed the way that films were presented, with the beginnings of the multiplex business. Now, it was commonplace for one venue to present multiple movies at the same time, sometimes on 10 screens or more, depending on the demographics of where you lived. Unfortunately, with the arrival of the multiplex, we saw a rise in movies made within the system and a diminishing of the independent film market. Exploitation films all but vanished during this time and foreign releases began to become much more of a niche market; becoming increasingly harder to find in smaller communities. Multiplexs would certainly dominate the film-going experience in the years to come, and the convenience of their availability would keep Hollywood secure in their ability to reach audiences all across America. But, the art house was not blotted out completely, and it would come back in a big way. In the late 80’s and early 90’s, independent film-making made a comeback, as cinematic tools and knowledge became more accessible in the years since the last independent boom. New voices from the likes of Richard Linklater, Gus Van Sant, Kevin Smith, and Quentin Tarantino rose out of this movement, and even though their popularity has earned them spots in the mainstream, they still maintain their independent spirit to this day. Also in this time period did we see the rise of the festival circuit, which started largely with Robert Redford’s Sundance Festival; a showcase primarily meant to highlight independent filmmakers. What is great about the independent film festival circuit in America is that it’s almost entirely hosted by these art cinemas across the country. Sure, Cannes and Toronto have hosted film fests long before Sundance, but those showcases haven’t tapped into the art house experience in the same way. In many ways, you do need that intimate atmosphere of an arts cinema in order to really appreciate an unique, independent art film. Sundance brought that to the attention of Hollywood, and in the years since, the studios have actually invested in the art house cinema market by creating their own independent off-shoots, like Universal’s Focus Features, or Paramount’s Classics, or Fox Searchlight, or Warner Independent. Not only are film festivals and art house premieres a great place to show off something unique, but they are also great places to try out a potential awards winner. In fact, many of the recent Best Picture winners at the Oscars have come from the Art House market, like 2011’s The Artist. It’s one of the reasons why Arts Cinema has matured to the point of being a permanent fixture in the cinematic community. So what makes going to an arts cinema so different from attending a multiplex, since there seems to be so much more cooperation between the two? For one thing, Art House cinemas not only presents us the audience with unique, outside-the-norm films, but it also goes out of it’s way to preserve some of the old fashioned cinematic experiences as well. Indeed, most art house theaters are actually remodeled from the old movie houses of yesteryear. Long before multiplexes started to become the standard, films were primarily showcased in large and often ornate auditoriums, much like theaters built for stage productions. In the years that followed the arrival of multiplexes, many of these old “movie houses” fell into disrepair and/or were re-purposed into something else; forgotten and lost to time. But thanks to the rise of the art house scene, many of these old movie houses were spared and given new life. 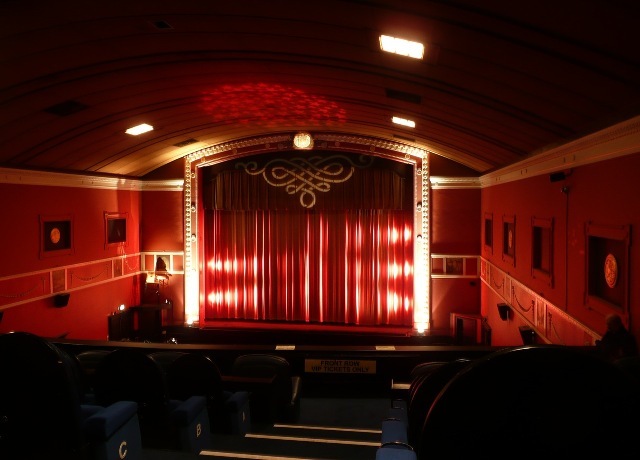 Mainly with the help of independent investors and a dedicated community of movie fans, you can find many of these places preserved and maintained as a unique cinematic experience. Because of this, art cinemas have managed to present a look at the future of cinema, while still honoring the past. In this sense, Art Cinema takes on a whole new meaning, as the theaters themselves could be classified as works of art. And the fact that these old-fashioned structures are used to showcase some films that could generally be seen as button-pushing is also a subversive treat. It’s interesting to think that you may be watching something as disturbing as the new Lars von Trier film in the same place where your grandparents had watched Shirley Temple sing and dance long ago. And for many cinephiles that is indeed one of the many pleasures of the experience. However, art cinema is not just limited to preserving an old-fashioned cinematic treasure. Indeed, if you have the money and the passion to create, you can turn anything into an arts cinema. This is something that’s been true in college towns across America for years, where arts cinema has always been alive. College students benefit largely from having a community that honors intellectual curiosity, so their demand for independent cinema has enabled film distributors to cater to this audience. And if there is no infrastructure in place to placate this group of cinephiles, no doubt some bright entrepreneur will find a way. That’s why in many college towns across America you will find art cinemas built into re-purposed buildings that were never meant for movies before. These include old office space, restaurants, warehouses, and even schools. In my hometown of Eugene, Oregon, the local arts cinema is actually built out of a defunct Episcopalian church, complete with the arched ceiling still intact. Seeing a movie in one of these place also adds to the whole cinematic experience, given the uniqueness of the surroundings. But, it’s not just unique places like a re-purposed church where you’ll find art cinemas thriving in towns across America. The rise of the cineplex also led to an inevitable decline, which led to the closure of many cineplex theaters across the country. Again, independent investors stepped in and some of these old multiplexes now specialize in art house films. That’s become the case in Los Angeles, where I live currently, as independent theater owners like the Laemmle company have brought art films to old, defunct multiplexes. Overall, arts cinema has become an avenue for any entrepreneurial movie fan to try out new things and make cinematic experiences unique for anyone looking to find it. Also, art house cinema has become a perfect place to present more than just movies. It has also become the place for communal activities centered around the movie industry. Usually, an art house cinema is where filmmakers and movie-goers can interact, either through one on one interactions or through a moderated Q&A’s. Film festivals commonly present these interactions, but sometimes a special appearance can be made as part of lecture within a college seminar, or a premiere screening. If these experiences can be found in your local arts cinema, than it is a one-of-a-kind experience well worth taking. Here in LA, there is a special program called American Cinematheque, which presents special screenings in old Hollywood movie houses complete with in-depth analyses by film-makers and film scholars alike, all with the purpose of educating the public about the importance of cinema. It’s a worthwhile, year-long program that I recommend that people check out, and if there are similar programs held in your local community, all the better. But unique communal experiences in an art house theater aren’t just limited to education. Sometimes it can be a party too. The Rocky Horror Picture Show (1975) has become one of the biggest cult films of all time and that’s largely due to the fact that it’s been in continuous release for almost 40 years, being a staple of the art house circuit and also an interactive experience for it’s audience. Not only do audiences watch the movie, they participate in the action on screen, singing along and even reenacting the moments in the film as it’s happening; and this unique experience has been endorsed and promoted by the art house scene for years. It’s also the only place where you’ll be able to find it. Once again, one of the many unique pleasures of an art house cinema experience. But why do we love Art Cinema so much today, even more than the tent-pole releases that come out of Hollywood? I think that it’s because they offer a much needed alternative. Variety is what keeps the industry alive, and indeed, when awards season comes around, it’s the small independent market that is put into the spotlight. Even still, Art Cinema still maintains a small slice of the whole Hollywood pie, but it’s one that nowadays is central to the whole piece. If anything has been lost in the shuffle, it’s that niche markets catering to very specific audiences have been lost. Exploitation films have become a thing of the past, and noble attempts to try to recapture that experience, like Quentin Tarantino and Robert Rodriquez’s Grindhouse (2007) still come up short. Also, with more interactions by major studios in independent film-making, are we truly seeing movies that are as groundbreaking as they used to be? Whatever the case, an Art House cinematic experience is still a great alternative to the same old multiplex junk, and more often than not, you’ll still watch something out-of-the-ordinary there. What I love best are the little discoveries; like a movie that you never thought much of before, but after seeing it in an Art House Cinema, it ends up changing your life. I’ve certainly had my fair number of experiences with these surprising gems over the years, like 2008’s In Brudges or 2011’s Drive. In many cases, I could only have found these special discoveries if for no other reason than I just wanted to watch them on a whim, and that’s that’s the kind of specialty that Art Cinemas offer. I don’t believe I would be the same kind of film buff that I am now had I not had a local Art House theater in my community. So, if you’re not interested in yet another dumb Transformers movie, I recommend that you search out an Arts Cinema in your area and find something more interesting to watch. That life-changing film could very well be in an Art House theater near you.